Research shows that there is a direct link between the amount of sleep a child gets each night and their performance in school. Children who don't get enough sleep often have trouble concentrating in class, learning new concepts, and sitting still. 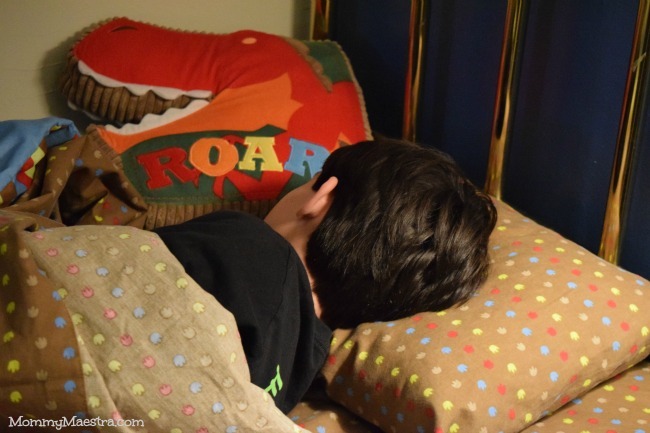 In fact, children who don't get enough sleep at night, sometimes exhibit ADD symptoms and may be misdiagnosed. Unfortunately, not all children have good sleep habits. And one of the most challenging moments parents frequently face is getting their children to stay in bed after they tuck them in at night. When my children were little, my husband and I made it a priority to read them a book every night before bed. For my husband, it was his way of connecting with our children after a long day at work. For me, it was a way to nurture their love of reading. We all treasured the opportunity to share a special story just between us. Today, a solid bedroom routine is still critical for developing good sleep habits in our children. Reading to your child remains, in my opinion, the best way to transition your child from the business of the day to the healing, regenerating sleep he or she needs. But I understand that all families are different and sometimes parents can't read to their child(ren) every night. Maybe you have to work late some nights, or you must travel and leave your child with another caregiver. Or maybe you are simply looking for something to use after your bedtime story. Whatever the reason, sometimes it is important to have a tool at your disposal. So when I was contacted by Elo Pillow to do a review, I said yes. 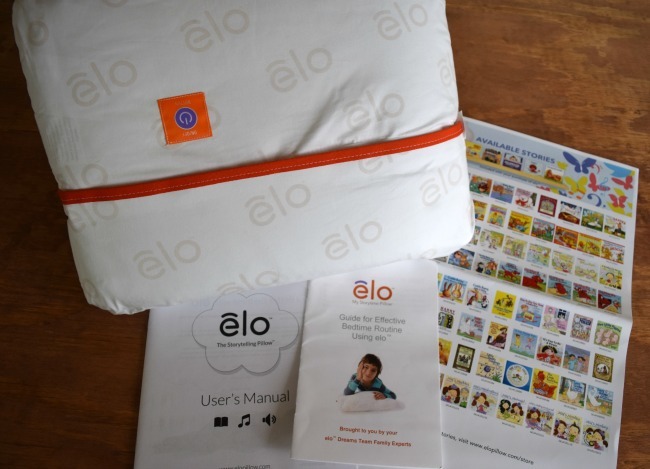 Elo is a bedtime system for children 2 - 9 years old that is centered around storytelling. It was developed by two moms who were struggling to keep their kids in bed. One wished she had a magic pillow that would stop storytime every time her child left the bed, and the other mom decided to give it a try. When it worked, Elo Pillow was born. The pillow has a storytelling device inside. When you first receive it, you simply register (for free) on the Elo website. 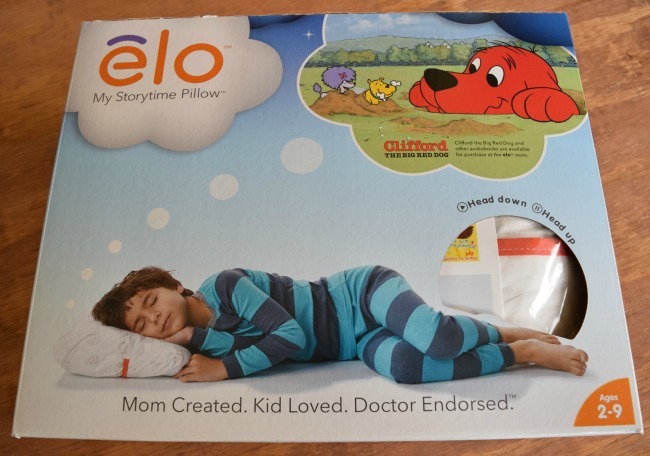 The pillow comes preloaded with one free SleepList (story), but you can purchase additional stories from the Elo shop. They are a bit pricey at $7, but if you were to buy 3 or 4, you could keep them on separate SleepLists and alternate playing each one on the nights you aren't able to read to your child or after you've already read to him. The SleepLists are around 20 to 30 minutes long. The SleepLists can be purchased from the Elo Store online, where you'll manage your account, select which story should play, and adjust the volume. Sometime before bed, you'll need to sync the pillow and download all the books/the playlist you want them to hear at bedtime. 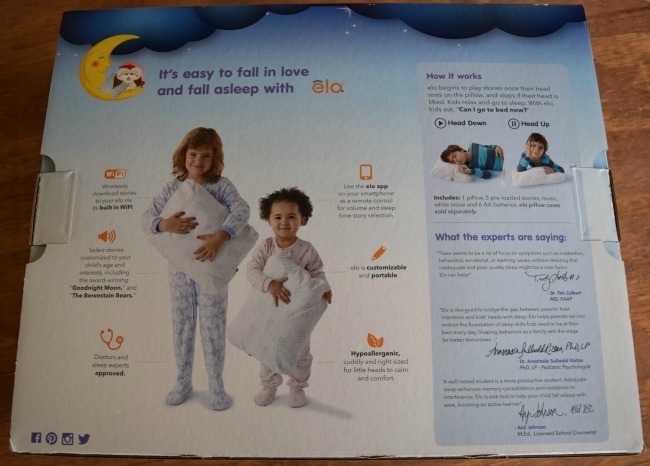 While the pillow comes with instructions, the Elo Pillow website also has a page with videos to show you how to use it. I was grateful because it was a little tricky to connect the pillow to the Wi-Fi and watching the video made it easier. Now I want to be clear right now that the pillow's Wi-Fi is not activated when your child's head is on it. (I wouldn't recommend this product if your child's head was in the direct path of the Wi-Fi.) You simply use the Wi-Fi to download the stories and then you can turn it off. The stories themselves are activated when you turn the pillow on and your child lays his or her head down on the pillow. If your child picks up her head, then the stories stop and they are encouraged to lay their head back down. The story starts back up again when their head is on the pillow and turns off when the SleepList has finished playing. It is simply powered by 6 AA batteries. But if you are still not totally comfortable with leaving it in bed with your child, you can just switch it out. My son tried out the pillow. I'm not even sure he heard the end of the story before he fell asleep! I don't think he moved once he put his head down except once at the beginning when he told me he couldn't hear it very well. I deliberately left the volume low so that he would have to be quiet to hear the story. He's a bit of a chatterbox. The only thing I wish Elo offered was bilingual and/or Spanish books. At this time, all I saw in their Elo Store was English titles. Overall, I would recommend this product if you are looking for a way to supplement your bedtime routine to develop healthy sleep habits in your child. And because they are so nice, one MommyMaestra reader will receive an Elo Pillow! Wouldn't this be a great regalito this holiday? To enter, just use the Rafflecopter below. Disclosure: I was sent this product for a review. All thoughts and opinions are mine. Would love to try it!!! !